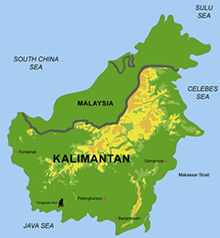 The province of Central Kalimantan contains about three million hectares of peatland, which is one of the larg¬est contiguous areas of tropical peatland in the world. 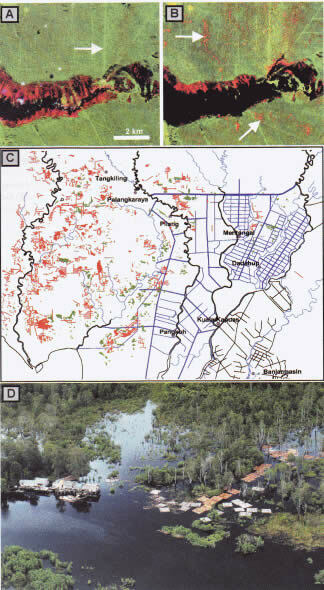 Peat Swamp Forests (PSF) are among the earth's most endangered and least known ecosystems. They have a huge carbon storage capacity but are extremely fragile and liable to disturbance. Local communities have used them extensively for centuries without significant impact on the environment. This changed in 1995 when a programme of massive peatland conversion, the so-called Mega Rice Project (MRP), was initiated with the aim of converting one million hectares of peatland, in Central Kalimantan, Indonesia, into rice fields. Between 1996 and 1998 more than 4000 km of drainage and irrigation channels were constructed in the designated area. Boosted by the El Nino Southern Oscillation (ENSO) episode in 1997, many fires initiated for land clearance purposes spread into pristine forest areas where they continued to burn with great intensity.